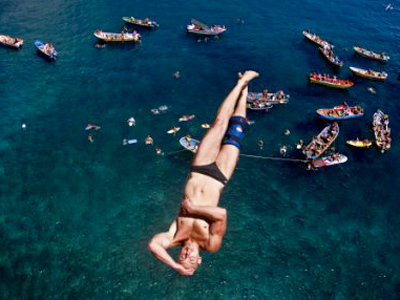 In the amazing spectacle sport called cliff diving there are only a few dozen people in this world who have the skills to do it at a professional level and one of the chosen ones is Russian Artyom Silchenko. He was just 22 when he won the 2006 World Championships. Since then he has rested easy among the cliff-diving elite, finishing overall third last year in the sport's most prestigious competition – the Red Bull World Series. The 27-year-old entered this season as one of the favorites with reigning champion Gary Hunt, and the sport's most decorated athlete the presently injured Orlando Duque in his sights. “Like every true sportsman I always want to win. Although you should forget about that before the dive because your main goal is not to get injured. But it's a competition and I always try to give my all,” Artyom explains. 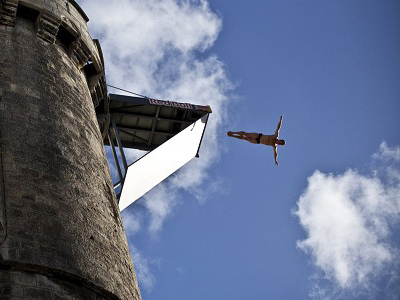 What cliff divers do is simply amazing but they are just humans. Diving from a height of over 27 meters, despite their outstanding ability and experience, is always a life-threatening situation. And fear is certainly not an alien concept to them although the ways to fight it differ. “With 10 to 15 minutes to go, the dive is the only thing in my mind. But when I'm standing there on the edge of the platform my head is empty. I'm just out of this world – no fear, no thinking… just me and the height,” says Artyom. “I believe my trainers are the best in the world. Tatyana and Gennady Starodubtsev who trained two-time Olympic dive champion Dmitry Sautin. They taught me great technique helping me to try a number of new high dives in the sport,” he says. An armstand dive is one of them, which is Silchenko's trademark. It is one of the most breathtaking, yet difficult, things to do in the sport, culminating with his original invention – a blind entry into the water. With some cliff diving events watched by thousands of spectators, concentration and focus is a must before executing a high dive. Although Silchenko claims the audience does not disturb him at all. “The more spectators the better. It gives me additional motivation and drive. It's great when you can hear the crowd cheer you on,” he notes. With three stages left, the Voronezh native is currently fifth in the overall standings. The next stop for World Series 2011 is Malcesine on July 24. Last year the Italian sun saw Silchenko produce one of his best performances ever and claim the stage win. Few would bet against him doing it again.